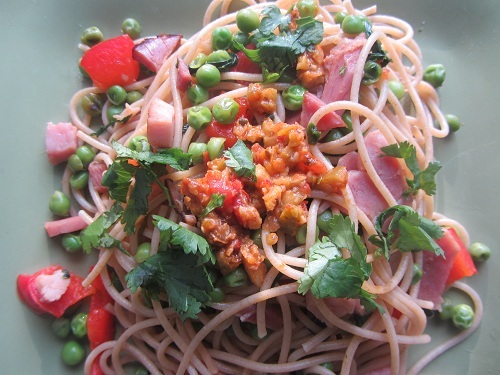 Ham pasta is a simple meal planning idea when you have leftover ham. Many cook a ham for Christmas or Easter! Leftovers abound, but you can only serve leftover ham for so many days before there is the chorus of, “No, not ham again!” You could freeze it for a later date or repurpose it into something that does not resemble the original meal at all! That’s what I did today and everyone loved this! It was really tasty! 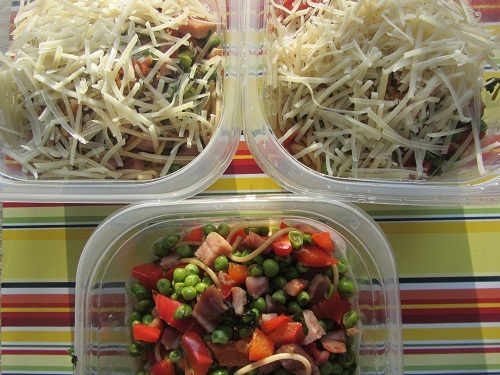 Pasta dishes are an excellent choice when you have picky eaters or family members with allergies. It’s simple to make the original dish and serve optional additions so each meal can be tailor made to likes, dislikes, and allergies. 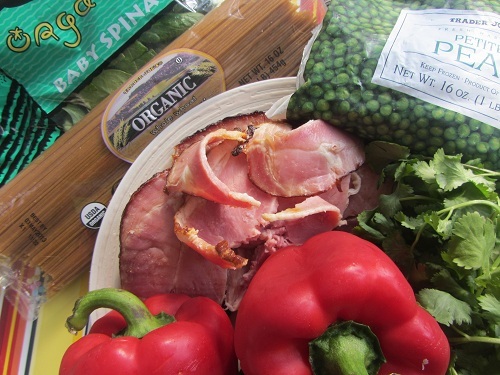 For this dish, I chopped about a half a pound of ham, 2 red bell peppers, and half of a bag of baby spinach. I stir fried them in a small amount of olive oil in my stainless steel electric skillet, until the pepper was still crisp tender. I then added a 16 oz frozen bag of petite peas to the mix and turned the heat down and cooked it until the peas were cooked through. 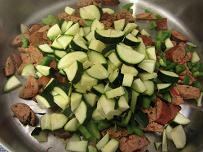 While this was cooking, I cooked a pound package of organic whole wheat spaghetti. 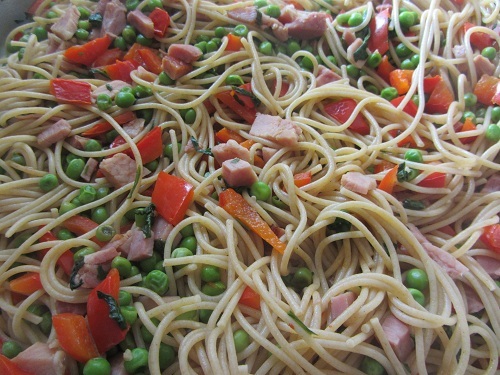 When the spaghetti was done, I added it to the ham and vegetable mix for a very pretty meal. I served the meal with several options; a plate of chopped cilantro, a jar of Trader Joe’s Green Olive Tapenade, and fresh ground parmesan cheese. Our son who hates cilantro was happy he did not have to add it, my son who is allergic to milk was happy he did not have to eat the cheese, and my husband and I added everything and it was an awesome treat! 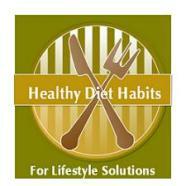 Pasta dishes are simple meals to change according to likes or dislikes. 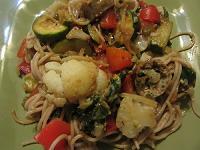 This dish could be made Vegan or Vegetarian by substituting in a can of white beans for the ham. If you were having a vegan for dinner, you could simply make the pasta and serve the ham on the side to be added by those that prefer meat. My sister is vegan and it is so simple to fix meals and leave the meat on the side. No trouble at all and everyone can happily eat! Quit sweating inviting a vegan to dinner! Heat a large pan of water to boiling and add the whole wheat pasta and cook according to package directions. Mine took 8 to 10 minutes. 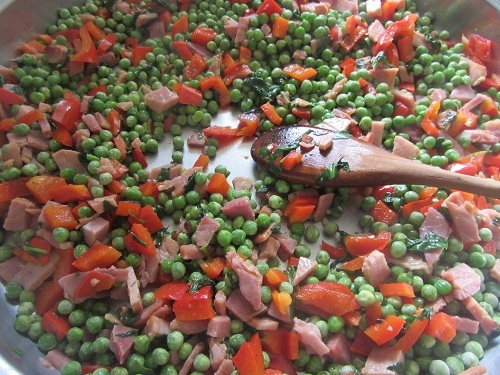 Add the peas and continue cooking until they are cooked through. 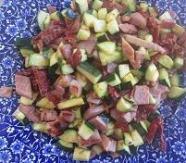 When the pasta is done, drain it, and add it to the stir fried ham and vegetables. Mix well and serve. Top with a couple of tablespoons of green olive tapenade, a generous handful of chopped cilantro and parmesan cheese. If you have vegan or vegetarian eaters, add a can of white beans, instead of the ham. 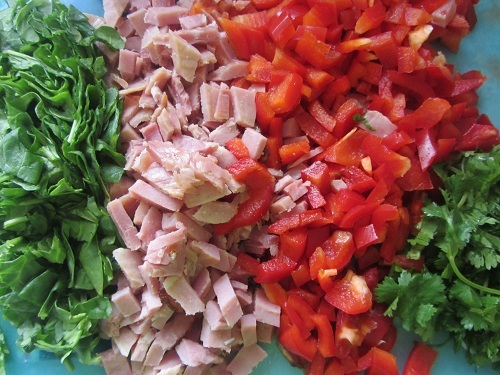 Cook the ham separately and add it as an optional topping! This was a very tasty ham pasta dish! The green olive tapenade added the zest it needed! 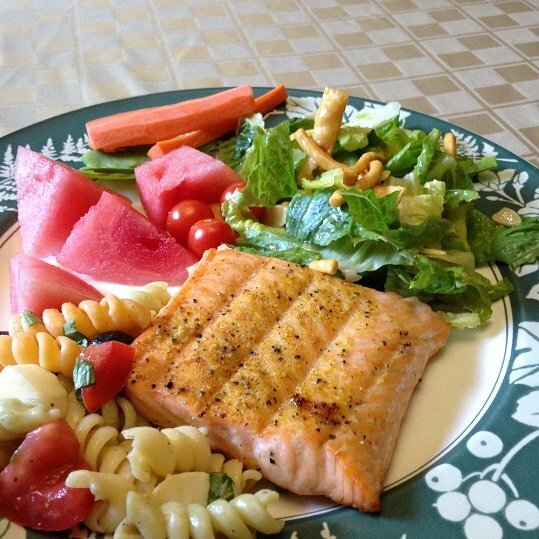 My favorite dinners are those that are cooked in one pan, quick, and taste great! 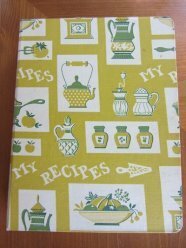 It’s a healthy diet habit to collect a few simple healthy recipes like this one for when you don’t feel like cooking. This main dish recipe is so much better than going out to eat! Box leftovers for next day's grab and go lunches! Saves money and time!